The HTC Vive first broke cover at MWC and then went on to win the Best in Show award, which is quite an achievement. Now HTC and Steam have opened the gates for developers who want to get their hands on one. Teams can sign up on the Steam website and have to explain exactly what they're working on and why they need a Vive. The powers that be at Steam will then send out a limited number of HTC Vive Developer Edition units to candidates they think worthy of the honour. This is the only way to get the Developer Edition: you can't wave a fistful of dollars in Steam's face instead. The announcement does say that commercial units are going to be available to buy later this year. 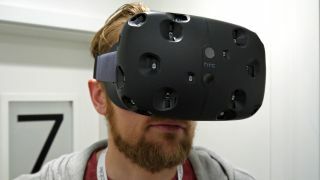 As cool as a virtual reality headset is, you're going to get pretty bored of it unless there are some killer apps to get engrossed in, which is why HTC and Steam are so keen to kick off the development process. "Our goal is to support as many VR content creators as possible and, to that end, we will be distributing dev kits continually, with new units going out every couple weeks," says Steam's blog post. "However, supplies may be limited." The development community message boards are going to be visible to anyone who wants to subscribe to them, so developers can follow along with the latest news and innovations even if they aren't chosen to get an HTC Vive of their very own.